What’s the difference in standard and dwarf trees? 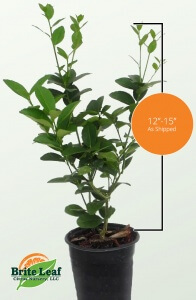 When you receive our trees, the standard and dwarf grafted trees are both 30 – 32″ tall. The difference is that the dwarf tree is grafted onto a rootstock that limits the mature size of the tree to around 8 – 9 feet tall and wide. 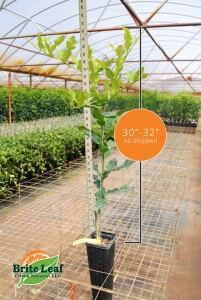 The dwarf tree is also more suited to container growing because the rootstock will not outgrow the container as quickly as a standard grafted rootstock. Most standard rootstock trees will mature at between 12 – 15 feet tall and wide. Can I send a tree as a gift? Absolutely! We will include a card with your personalized note with any gift order. We will send the receipt to you, not the gift recipient. Your local extension agent or Master Gardener is a great resource. The online community is also a wealth of knowledge. Try Dave’s Garden or GardenWeb. Are your trees disease free? Yes. We grow our trees according to state regulations inside enclosed structures. We are inspected by the Division of Plant Industry and USDA every 30 days. Our budwood sources are on-site and also inspected every 30 days. Budwood source trees are tested twice a year for citrus greening and various other diseases. We take every precaution to prevent disease in our nursery. This is one of the reasons we don’t allow visitors inside the nursery. Why do you grow citrus trees in a greenhouse? Many people ask why you have to use a greenhouse when in sunny Florida. State of Florida CFR 5B-62 requires that all citrus nursery trees be produced inside enclosed, insect-free structures. Any citrus nursery that is in business in Florida is legally required to have a greenhouse with screen on all sides with a “double entrance” and positive air pressure to prevent insects entering the structure. In our case, we also relocated our nursery from Hillsborough County (heavy citrus production area) to Sumter County (no commercial citrus) to further protect from diseases and insects. Prior to January 1, 2007, most citrus nursery trees in Florida were grown outside. Citrus greening is a disease caused by a bacterium that can infect most citrus varieties and some ornamental plants. It was first detected in the US in August 2005 in south Florida. It causes the tree to produce small, unprocessable fruit. The tree will eventually die. To learn more about citrus greening, Download PDF. Citrus canker is bacterial disease. It is contagious and can be spread easily by windy rainstorms. The 2004 hurricanes in Florida spread the disease throughout the state. Citrus canker affects the leaves, stems and fruit. It is a scab like lesion with a yellow halo. If you suspect Citrus canker, have your local extension agent look at your trees. To learn more about citrus canker, Download PDF. What is a “Giant Finger Lime”? The Giant Finger Lime is “new”. I have 2 trees that I use as my budwood source. 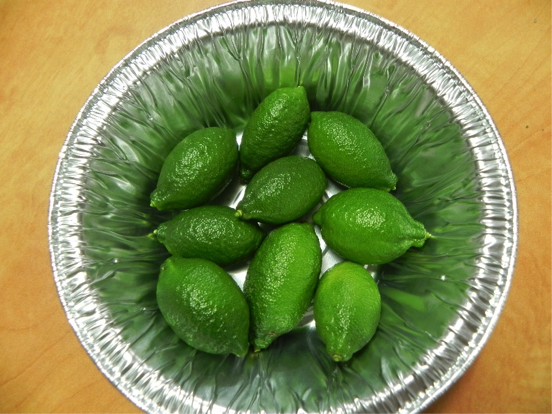 These trees were obtained through the Florida Department of Agriculture’s budwood facility as Australian Finger Limes. When my trees started fruiting the fruit did not look like it should. So, I contacted the state to research the issue. It turns out that the trees they had supplied me with were a bud sport off of an Australian Finger Lime. They were unaware of the difference until somebody’s tree produced fruit. Faced with many nurseries having propagated trees with this budwood, they decided to give it a new name. The fruit inside looks just like all the finger limes that I have seen. The outside shape is all that is different. Hence my description on the website as being similar. Why can’t you ship trees to CA, TX, AZ, LA?